What is the use of a vector in Spigot? A vector is represented by a length and a direction and always describes a movement from one point to another. 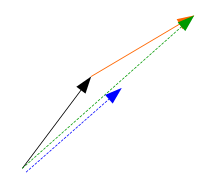 Most of you will already have heard about vectors or seen some strange arrows representing them. Let's have a look at the vector in Spigot. Each vector has three values that represent the vector, called X, Y, and Z (the 3 directions). Also important to know is that you can get the length of a vector by calling .length() and subsequently get / set the value of every axis by calling .getX(), .getY(), .getZ(), and .setX(x), .setY , .setZ(z). Whenever an entity moves or the target you're are looking at has to be calculated, a vector is used. At the end of this tutorial, you should be able to do both. Let's explain the possible calculations. * The blue arrow is always the result of the calculation. This calculation is very basic. You got one arrow and add it to another. Lets code it! // Let's add them together! The second simple (and essential) calculation. Just multiply the length of the vector. 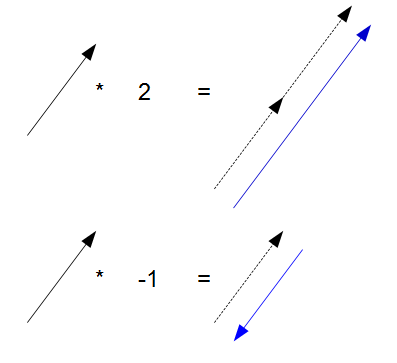 When the value given is NEGATIVE, the vector switches its direction. As you see, every value of the vector is being multiplied with the value you specify. Sets the vectors length to 1. For example, you have a vector (3, 3, 3). Then, its length is the √( (3*3)+(3*3)+(3*3) ) = √(27) = 5.19, so the vector's length is 5.19. Normalizing now has to divide the vector's length by its length to get the resulting vector. So normalizing calls .multiply(1/5.19) resulting in a vector of (0.57, 0.57, 0.57). This calculation returns a vector that is orthogonal to both of the previous vectors. Its length is the area of the light blue parallelogram. This can be used to compare if two vectors are nearly the same (for example, when targeting a player). This is easy! Take one vector, add it to another, and divide by 2. Then you have your midpoint! 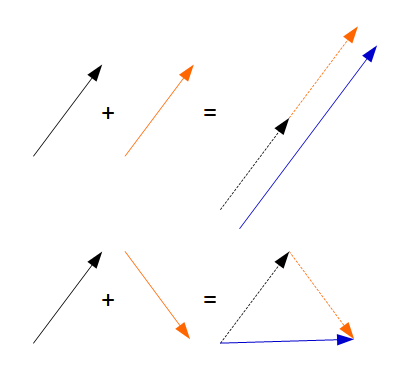 You have two vectors, the black and the orange one. You add them together and get the green vector. You divide the green vector by 2 or multiply it by 0.5 and get your midpoint. Now you know how to use vectors! Time to practice a bit! Let's check if a player targets another location!